Home / Our Work / Hugo's. Creation of a startup retail brand in Bristol. Hugo’s. Creation of a startup retail brand in Bristol. Hugo’s is a startup greengrocer deli. It’s part of the new wave of businesses in Bristol started up by young entrepreneurs who have big ideas and a strong vision to bring ethically sourced products to the ethically minded foodie people of Bristol. Reach created the brand identity which has been used in the shop signage, the packaging, merchandise, flyers and advertising as well as playing a key role in the Crowdfunding campaign that was an intrinsic element of Hugo’s gaining the funding for launch. This was the first time I’d gone through the branding and design process so was really grateful for the easygoing style of Simon and Caroline . They took the time to guide me through each stage of the project and without them I couldn’t have translated all the ideas and the vision in my head into a such a standout brand. Hugo’s first saturday job as a young man of 14 at Reg the Veg in Bristol instilled in him a passionate interest in food and in particular fresh produce. He went on to study and work in fashion marketing in London for several years, until his passion got the better of him and he left London to work on organic farms in Italy for 6 months. 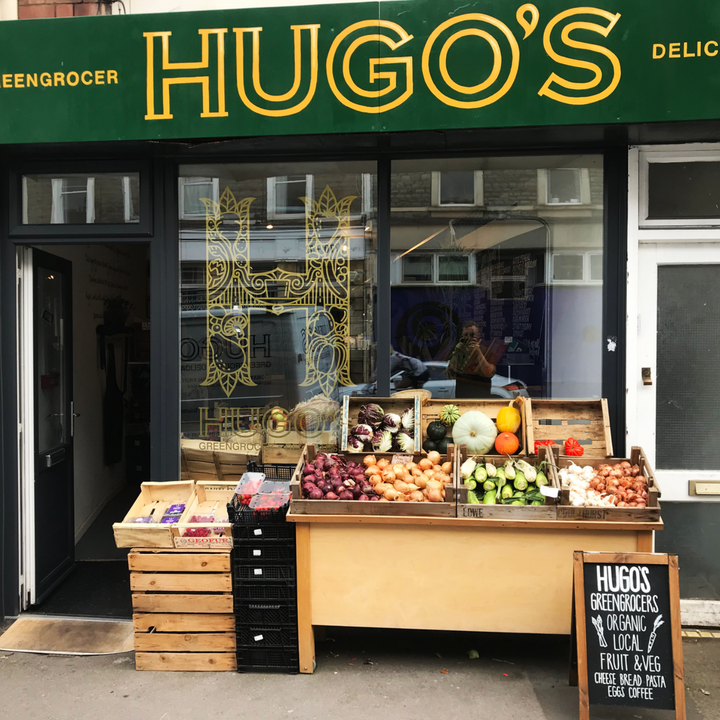 Working with Italian farmers instilled in him the drive to launch Hugo’s Greengrocer Deli and it inspired his vision of a shop that would only sell seasonal produce thus providing his customers with the best nature has to offer. He spent the next year working in a greengrocers in Bristol, saving every penny he earnt. He built a persuasive business plan that would give family the confidence to invest in him. Finally he ran a successful crowdfunding campaign, then found the right premises and opened Hugo’s in Bedminster in February 2018. As Hugo is in fact the son of Caroline and Luke, the 2 Reach directors, Reach were the obvious choice to create the branding! 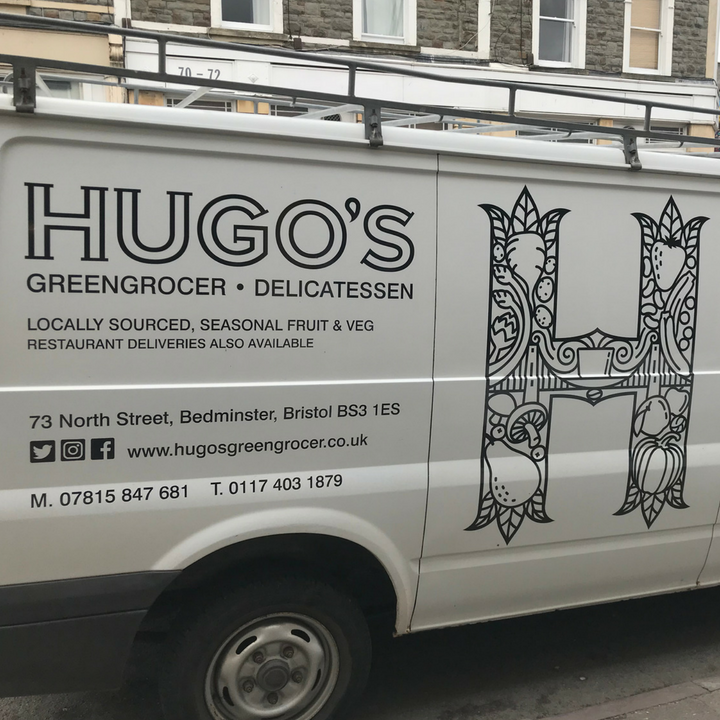 As always with a startup business, Hugo knew the branding would be key to the success of the business; it needed to symbolise what would set Hugo’s apart from the usual greengrocer. He also needed a logo that was incredibly flexible, that would work well on a t-shirt and carrier bag as well as a shop frontage and a web-site. 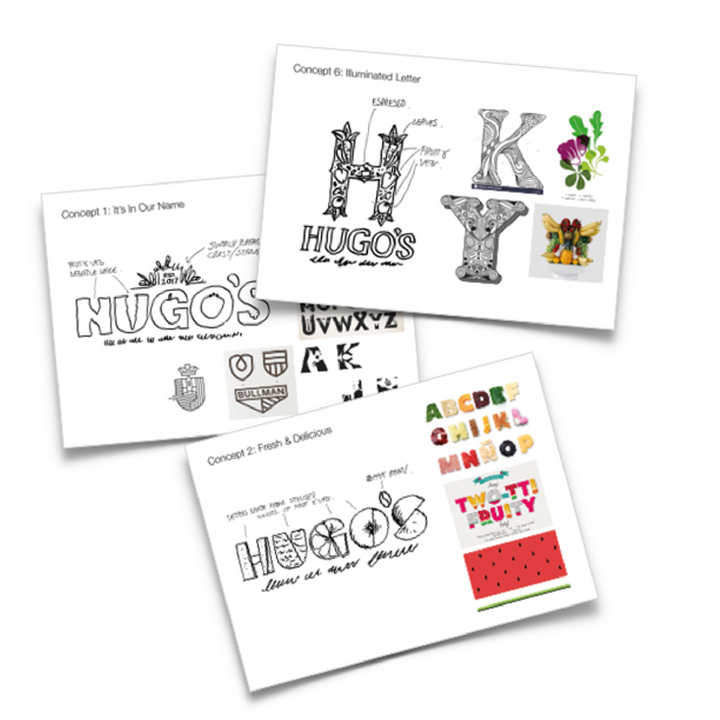 The brand identity needed to be distinctive, recognisable and quintessentially Hugo’s. 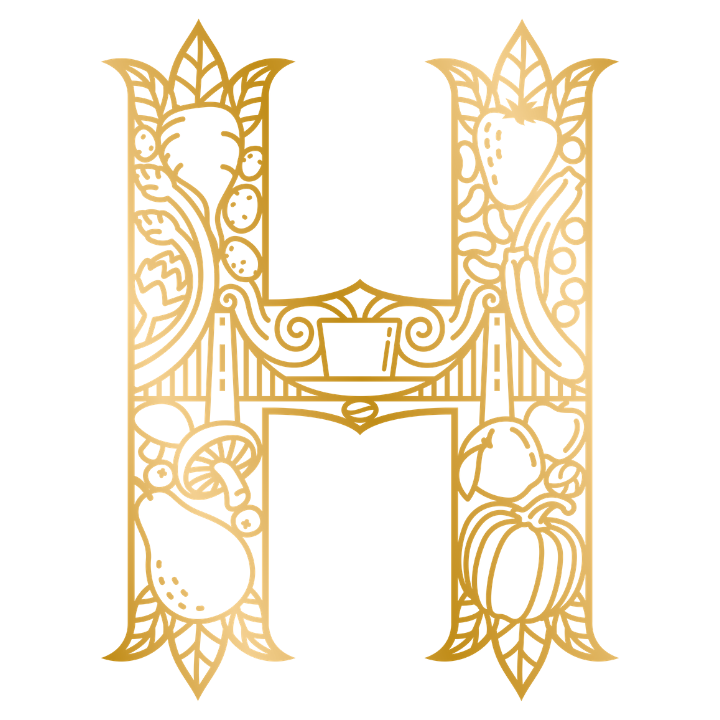 Although the shop wouldn’t launch until February, we created the brand identity in October so that Hugo could use it to bring his vision to life for his crowdfunding campaign. The great thing about start ups by millennials is that they have such strong beliefs and ethics and often a great story. 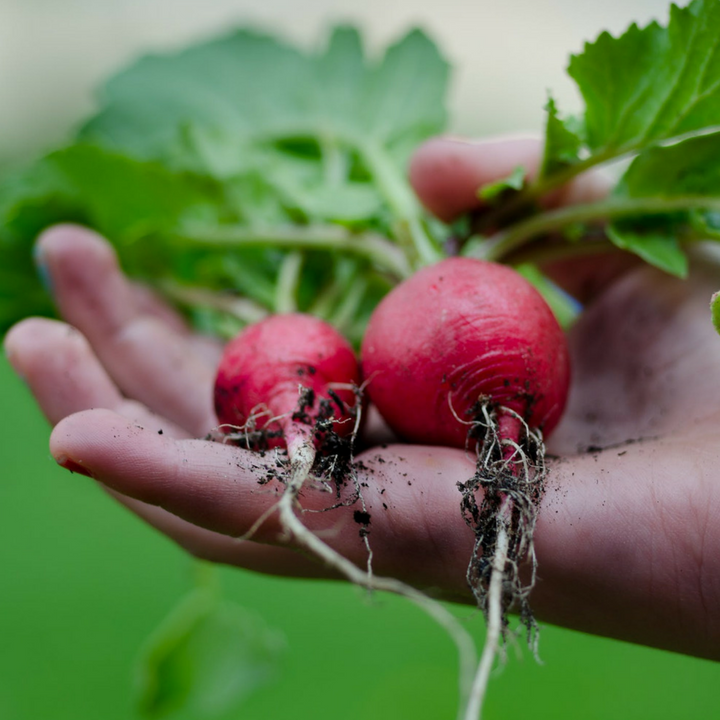 Hugo’s belief that fresh food is best when eaten in season – forget strawberries in January and asparagus in December – coupled with his strong Bristol roots gave us plenty of inspiration and direction. Given the budget was tight, it was important for Hugo to give us a clear idea of what his vision for the design was; were there any particular greengrocers or retailers whose use of colour, typography or design he felt were appropriate for his new brand. Getting inside the head of the client and helping them to articulate what they do and don’t like is really critical. It means our clients are delighted every time we present creative work to them as it fits with their design aesthetic but thrills them with the magic of our creativity. Nestling within that is an espresso cup and saucer – yes, its a greengrocer that serves espressos too! Creating a brand identity before you launch a product or retail brand can be invaluable when talking to investors. It crystallises your vision, demonstrates your own investment to date and helps bring your project to life for investors who won’t spend too long considering whether to invest.